Some brief notes on the Swire Waste Services Ltd.
Swire BFI Waste Services Ltd was apparently formed in 1987 as a 50:50 joint venture with Browning Ferris Industries. I am assuming, until corrected that BFI refers to Browning- Ferris Industries a North American waste management company that was disbanded in 1999. 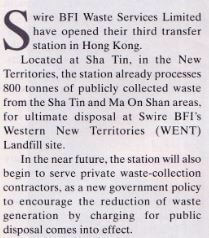 In 1993 Swire BFI won a 50-year landfill management contract in Hong Kong. 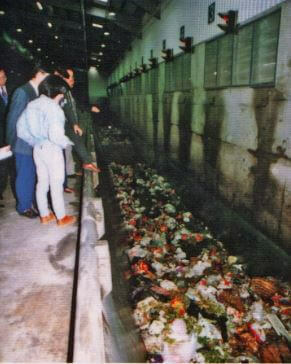 In 1997 Swire BFI Waste Services Limited acquired a 30-year contract with the Hong Kong Government Environmental Protection Department to restore two landfill sites in Tseung Kwan O. Swire BFI also opens the Island West Transfer Station. IDJ has sent the following brief account of Swire BFI Waste Services Ltd in Shatin which adds to our recently posted articles about waste disposal in Hong Kong, linked below. Swire BFI Waste Services Limited have opened their third transfer station in Hong Kong. Located at Shatin in the New Territories, the station already processes 800 tonnes of publicly collected waste from the Sha Tin and Ma On Shan areas, for ultimate disposal at Swire BFI’s Western New Territories (WENT) Land fill site. In the near future, the station will also begin to serve private waste-collection contractors, as a new government policy to encourage the reduction of waste generation by charging for public disposal comes into effect. Processing and transporting waste away from its urban source quickly and cost-effectively, but using methods which are both environmentally and community-friendly, is a matter of key importance to Swire BFI, and the company has consulted closely with the Government’s Environmental Protection Department (EPD) on every stage of the design and construction of the station. Combining the latest international technology with considerable experience in waste processing, Swire BFI’s new transfer station is already playing a vital role in implementing EPD policy: and its greatest attribute is that, with its accent on keeping environmental impact to the minimum, its presence goes almost entirely unnoticed by its neighbours in the Sha Tin community. This article was first posted on 5th February 2018.